According to the Centers for Disease Control and Prevention, truck drivers have higher rates of heart disease, diabetes, hypertension, high cholesterol and obesity when compared to other adult workers in the U.S.
Thankfully, eating healthy and making minor lifestyle adjustments while on the road can help get truck drivers to a healthier weight, which will lower their risk for the previously mentioned health problems. Making healthy choices while driving doesn’t have to be a challenge. Here are a few easy ways to keep fit. Before hitting the road, go to the grocery store where you will have more and healthier options — along with lower prices. Before buying a snack, take a look at the food label and see what the serving size is and how many calories and fat, sugar and cholesterol grams are in the one serving. If you stop to order food while on the road, try to avoid adding extra toppings such as mayonnaise, extra cheese or dressing. These extra items can add up to 150 more calories to your meal. By packing meals ahead of time, you have a better chance at controlling your portions. Most serving sizes are about 1 cup. Try to measure out a 1 cup serving of your favorite trail mix and put it in a baggie. You may be surprised by how satisfied you feel after eating this serving (and your snacks will last longer!). Don’t forget that while eating healthy, you must also stay hydrated. When considering your beverage, note that water is always the healthier (and cheaper) option. Not a huge fan of plain water? Dress it up! Add some flavor by using either Mio or a Crystal Light packet. Or slice up some fresh fruit such as strawberries and kiwi, and add them to your bottle of water. It only takes a small change to make a big difference in your overall health. Try implementing one or two of these tips into your daily routine while on the road and see how much of a difference it makes! 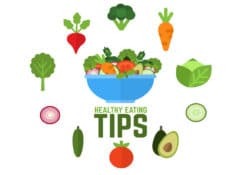 For more tips about eating healthy on the road and other truck driver lifestyle hacks, check out our posts on healthy meal ideas on the road or the story of one of our very own drivers who went through an incredible weight loss journey by changing his trucker diet and lifestyle routine. What are your favorite tricks to eating healthy while driving? Let’s get in touch!